your making me hungry! I'm sure it's the happiest place on earth...without kids. I AM SOOO JEALOUS! I love the Monte Cristo, we were so sad when Bennigan's went out of business because they had that sandwich. Have so much fun! Lucky! Justin and I are too cheap to eat there. We're always packing in our own lunches. Isn't Disneyland just magical? We love it there! We were there on the 28th and 29th as well...wasn't it great?? ?weather, crowds, but we had the kids with us! How fun, just the two of you got away! 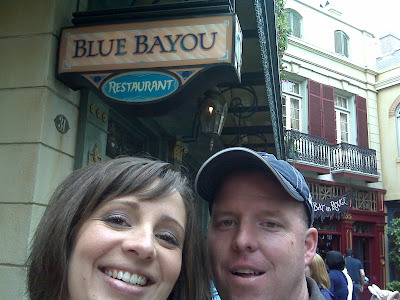 We LOVE the Blur Bayou! I think Disneyland is tons of fun. It can be fun to watch the kids have so much fun.But I think it is a blast just with adults.